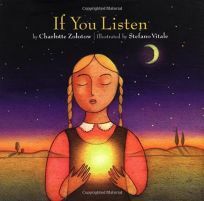 A girl longs for her faraway father in If You Listen (1980) by Charlotte Zolotow, newly illustrated with serene illustrations painted on wood by Stefano Vitale. ""If I can't see him, or hear him, or feel his hugs, how can I know he loves me when he isn't here?"" she asks her mother. In one spread of mother and daughter listening and waiting, Vitale's surreal scene recalls Chirico in composition and palette.